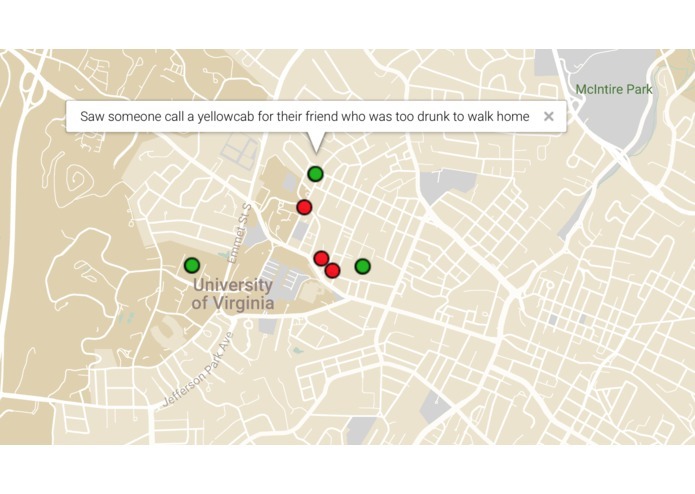 RedDotGreenDot is a project that lets UVA students anonymously add red and green dot events to a distributed, verifiable, immutable1 database and access the data at any time in the form of a flexible, scalable heatmap. A red dot event is when a person is put in an emotionally, mentally, or physically threatening situation by an aggressor. While red dots are sometimes easy to spot, green dots, their positive counterparts, are often overlooked and go unrewarded. 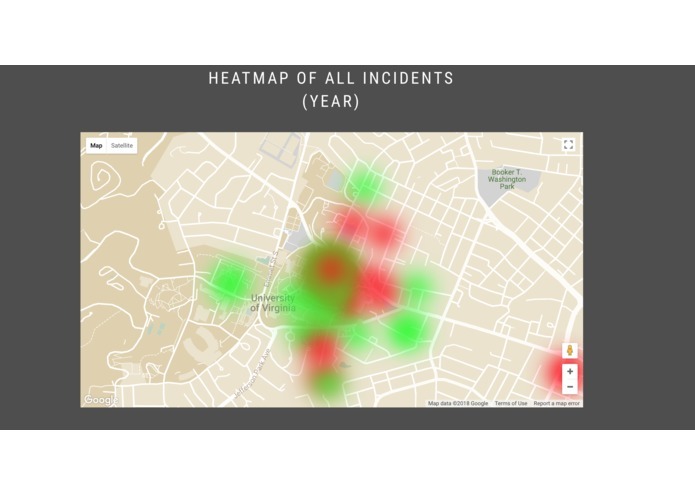 RedDotGreenDot provides an elegant solution for this problem by combining reporting, viewing, and data gathering in a simple and visually pleasing platform. 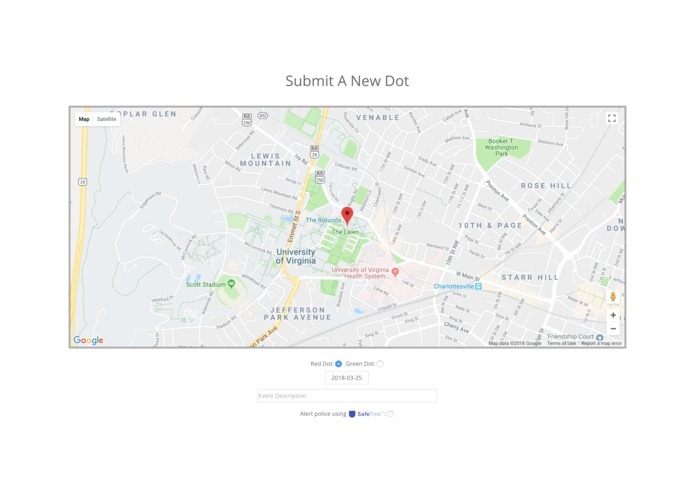 While it is currently built to support UVA and the surrounding Charlottesville area, RedDotGreenDot can be easily and rapidly scaled up to cover other important locations. While RedDotGreenDot is built with a focus on Web 2.0 sensibilities (user-generated content, lightweight design, etc. ), smart code also allows it to accomomdate a range of user characteristics, ranging from interoperability between browsers to CSS based rescaling. From the use of a single Github branch to increase team dialogue to the diverse team itself, RedDotGreenDot has truly been built to serve the needs of its users. 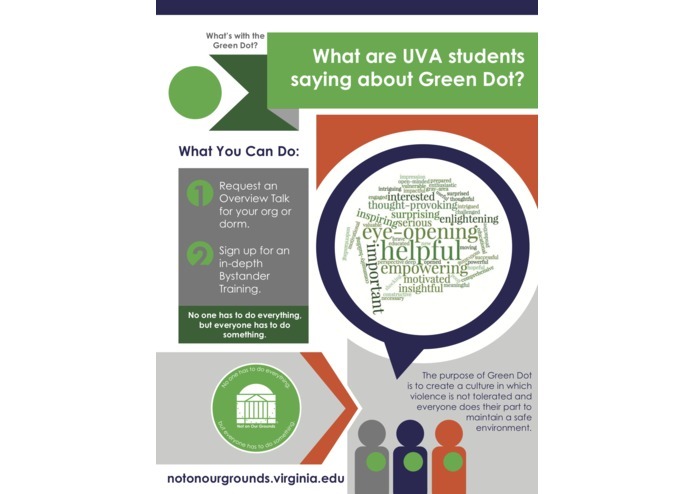 It facilitates the transfer, analysis, and discussion of critical information for the wider UVA community. Data entry is made simple and intuitive through the use of clean, familiar archetypes as well as paradigm-shifting data visualization for full information transfer. Alert police about an ongoing event with the click of a checkbox. 1 The data is protected from further user inputs but can be changed server-side to remove personal information. I worked on the backend and the event submission form. I worked mainly on our display map showing the red and green dots. I worked on the heatmap and the custom map styles. I also wrote the readme. I worked on front end development.